No, not blackberries—they're "black raspberries." It's a flavor I'm familiar with (ice cream, lollipops) but a fruit I'm not sure I've encountered in its natural state. These suckers just arrived at the Fair Food Farmstand from the Wyck House in Germantown. 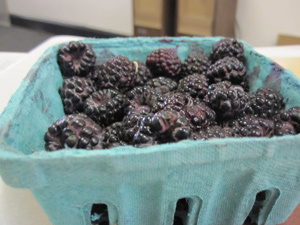 Less tart than red raspberries, the dark morsels are a mild, delicious treat. I ate the whole carton in one sitting.